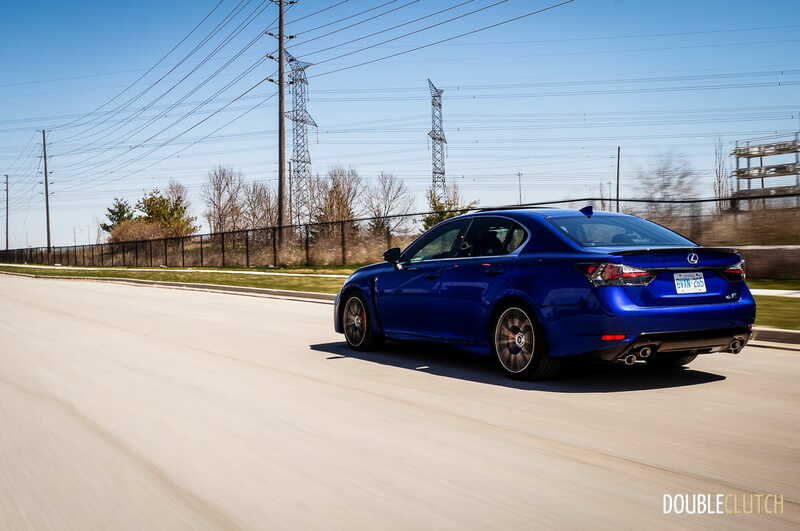 The GS-F produces its own excellent brand of music, all thanks to that 5.0L V8. 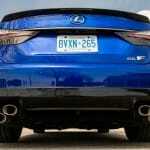 Lexus has been on a roll lately, with hot sellers like the NX and RX selling every single unit they can make. 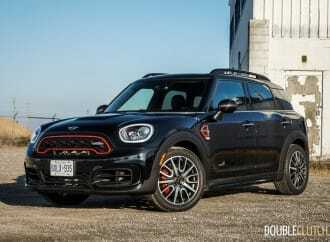 The IS remains a popular seller, with the new IS 200t (reviewed here) finally going head-to-head with the turbocharged four-cylinder rivals from Europe. 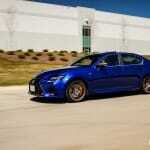 One thing that hasn’t made a return, is a hot-rod version of the Lexus IS. 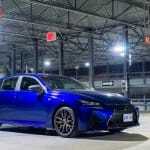 The second-generation IS was cool because of its powertrain: an honest-to-goodness, naturally-aspirated 5.0L V8, sending power to the rear wheels through Toyota’s 8-speed automatic transmission. 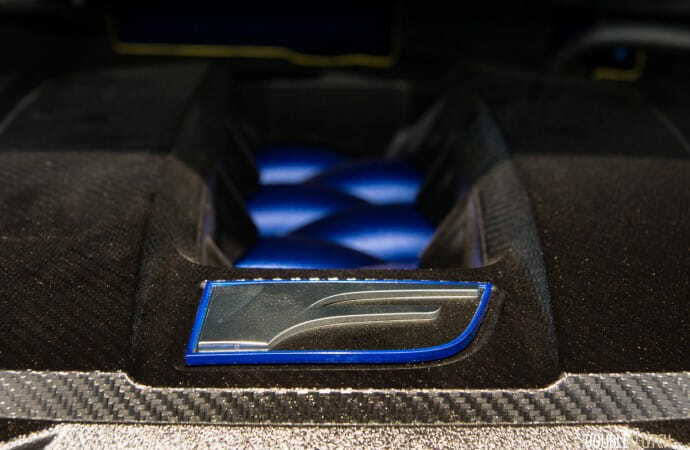 Enthusiasts were left wondering whether they would see this V8 again. 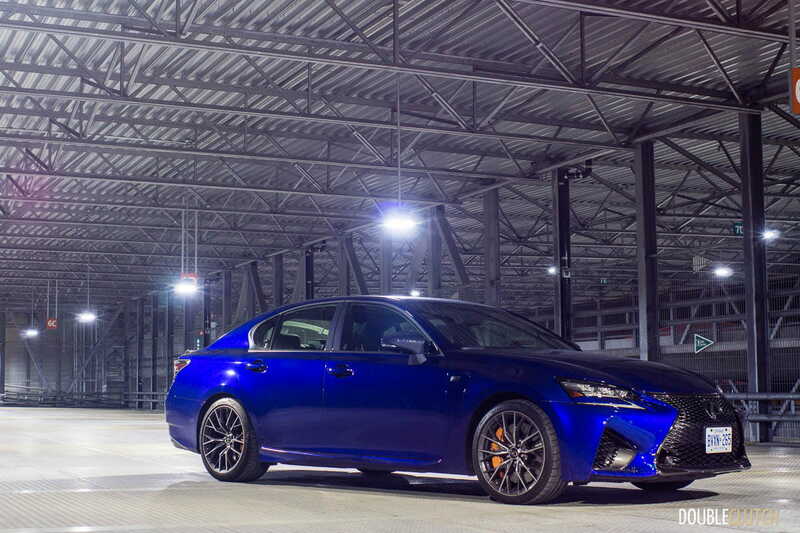 The current Lexus GS was introduced for the 2013 model, with V6 power, rear-drive by default, and all-wheel drive availability. 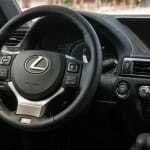 It brought along Lexus’ early interpretation of their new Spindle Grille. 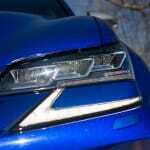 Now seen across the entire lineup, the GS at the time still had the main bumper beam dividing the grille in two. 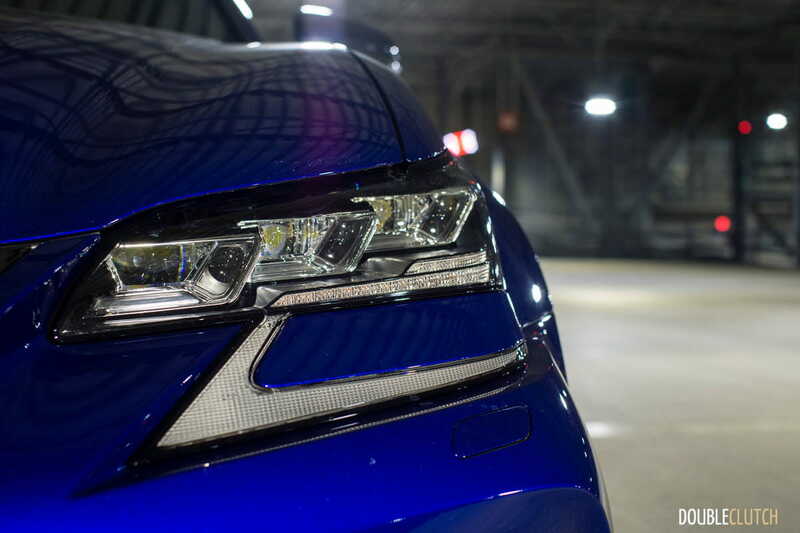 An update for the 2016 model year changed the grille and headlights to match the rest of the Lexus family, but the big news was the announcement of the GS-F. 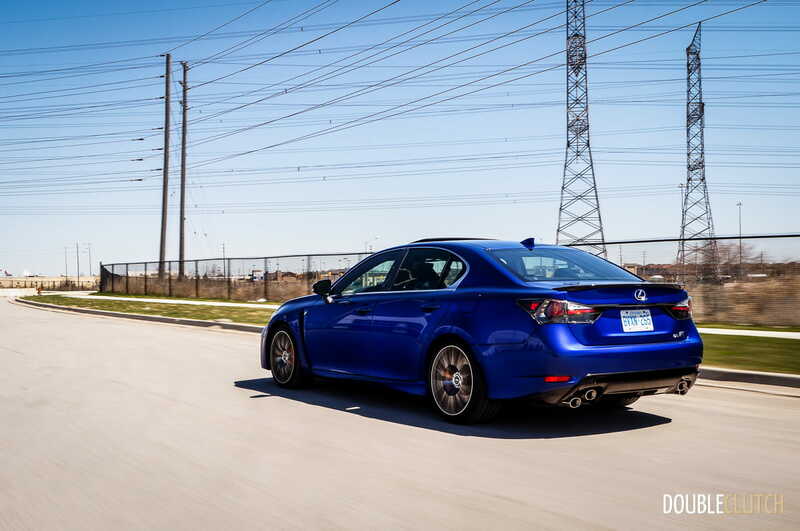 This wasn’t a mild F-Sport trim package, this was the real deal. 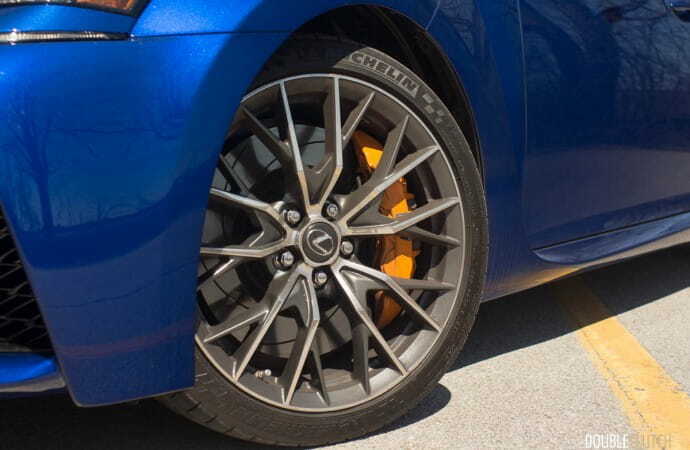 I was excited to pick up the 2016 Lexus GS-F, in a beautiful shade of “Ultrasonic Blue Mica 2.0”. 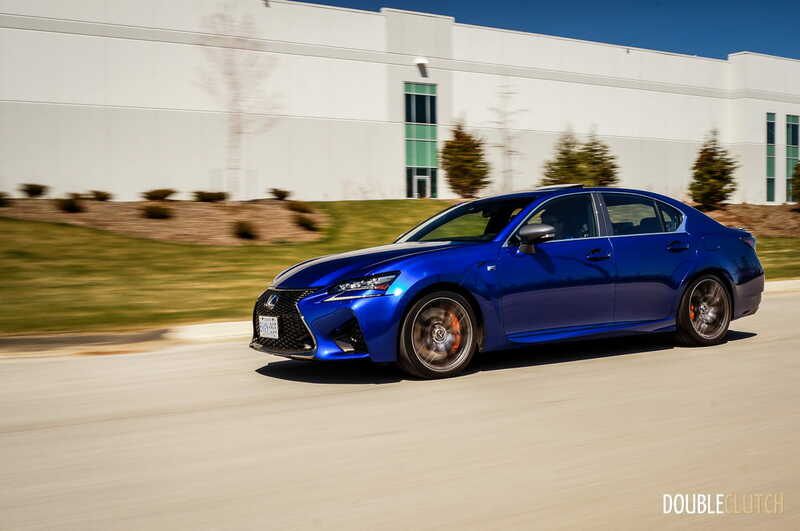 This car is all about the powertrain, and how Lexus’ updates keep it fresh in a demanding segment, bristling with expectations. 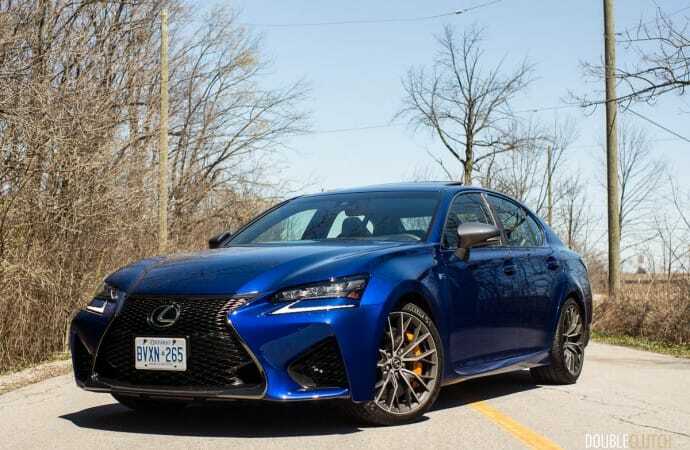 Firstly, a caveat: one thing I’ve noticed when the GS-F was announced and unveiled, was the inevitable comparisons made between it and cars like the BMW M5 and Mercedes-Benz E63 AMG. 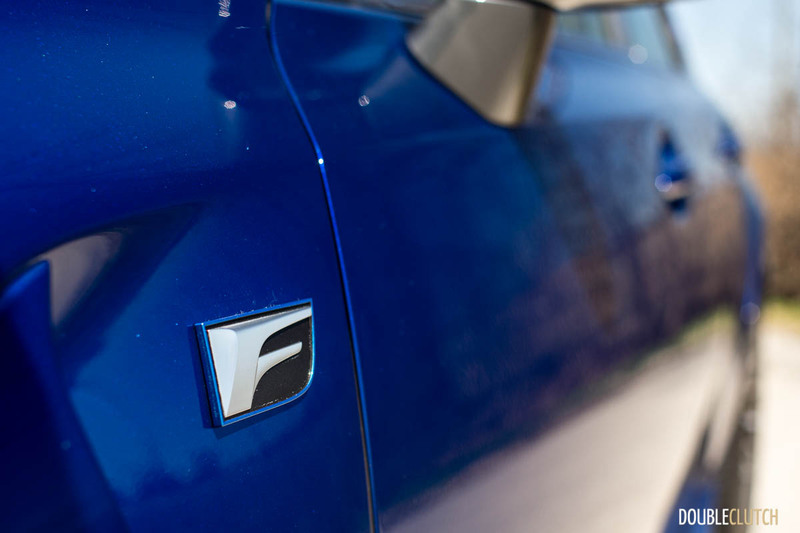 While this car does wear the performance flagship “F” badge, its performance credentials don’t quite match up. More on this later. 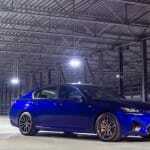 The Lexus GS has always been a good-looking car, in my eyes. It was never as “heavy”-looking like the BMW 5-Series (reviewed here) was, or as conservative as the Audi A6 (reviewed here) or Mercedes-Benz E-Class. 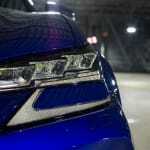 The new headlights now feature the separated daytime-running LED lights from the rest of the headlight cluster. 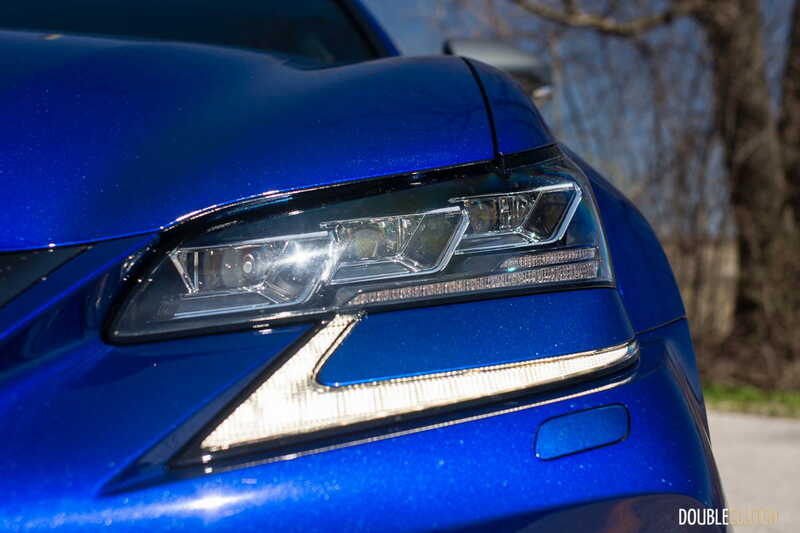 In a slightly unique twist, the main headlight module and LED strip actually form one unit, unlike the lighting setup on the smaller IS sedan. 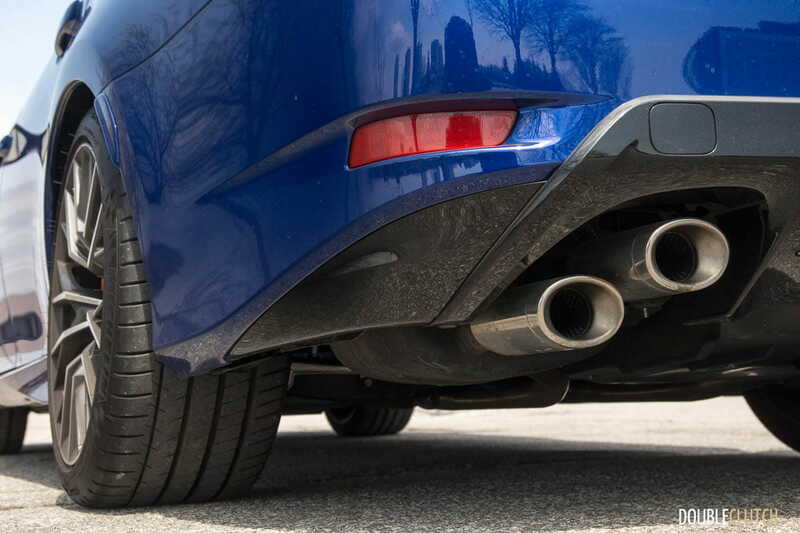 Out back, the signature “F”-style stacked exhaust sets the car apart from its competitors. Detractors will claim that it’s a little too strange to have the tips arranged in this manner, you can’t deny it’s a unique arrangement – I for one, like it a lot. 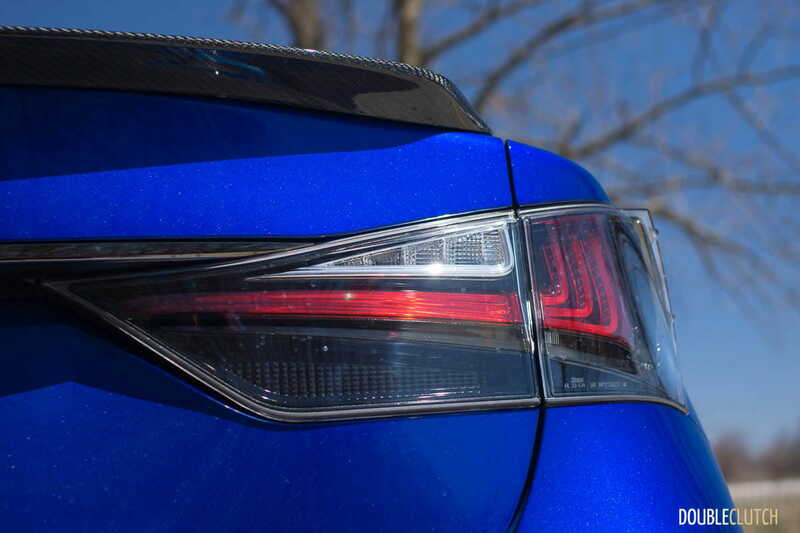 Clear-lens taillights round out the changes out back. 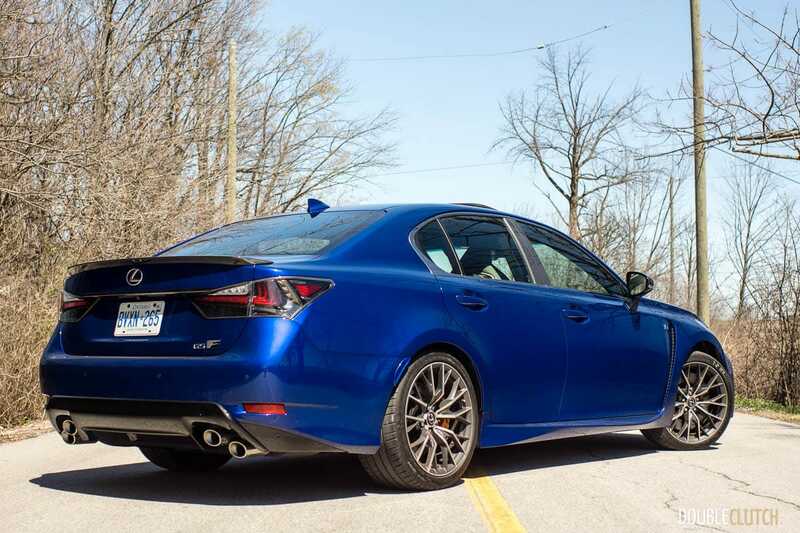 In short, the GS-F is a car that manages to be just the right size with more than just a few subtle hints of the performance under the hood. 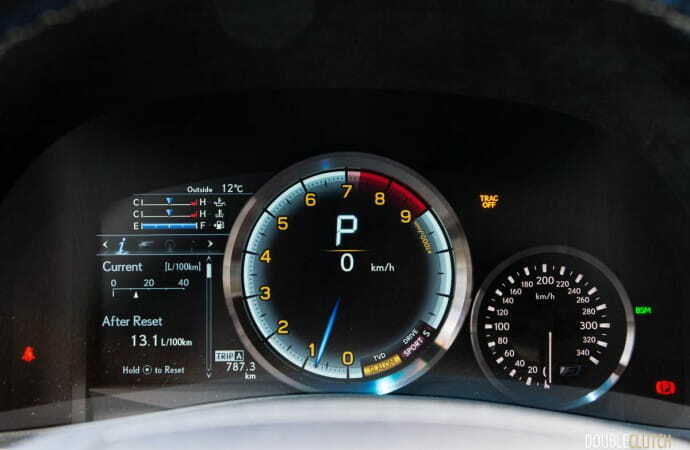 The fog lights seen on the GS350 (reviewed here) are deleted on the F, to make way for additional cooling hardware. 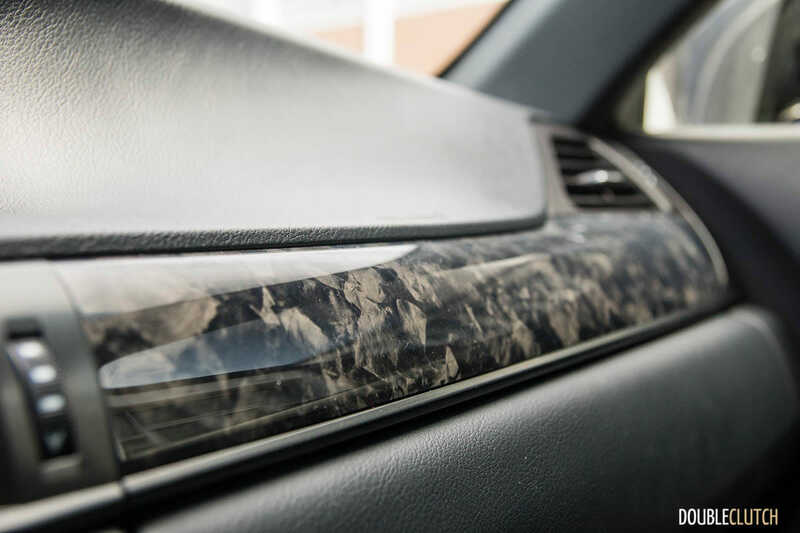 If you look into the grille openings that flank both sides of the centre Spindle grille, you’ll see additional radiators that remove heat from the engine oil and transmission fluid. Thermal management is everything when you’re pushing the car hard, and Lexus has designed the GS-F to stand up to serious duty. Inside, the GS-F is thoughtfully updated, as well. 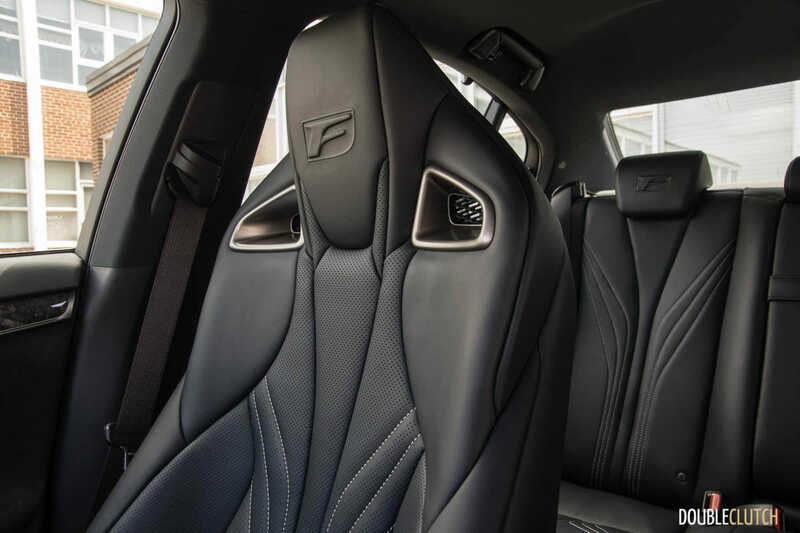 The unique “F” seats not only look fantastic, but feature aggressive (yet still practical) bolstering, along with seat heating and ventilation. 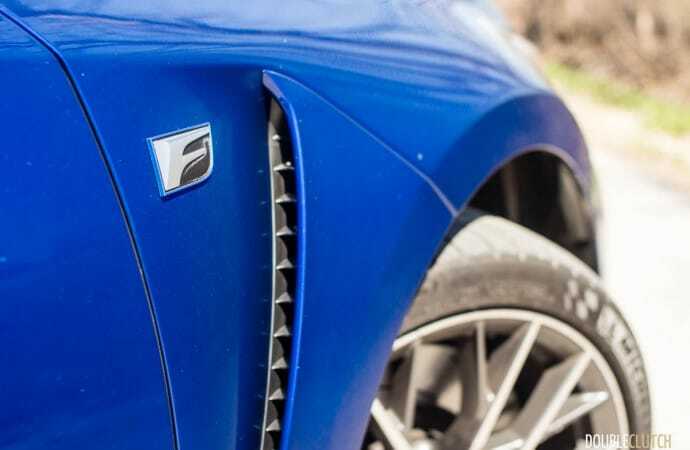 Somewhat bucking the trend in performance cars these days, the GS-F doesn’t feature the typical carbon fibre trim everywhere. 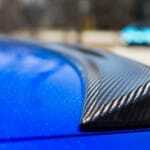 Instead, Lexus fits it with a “forged carbon composite”, which features a more irregular pattern, rather than a criss-cross weave. It looks somewhat like the weaves and layers of a piece of mica rock. 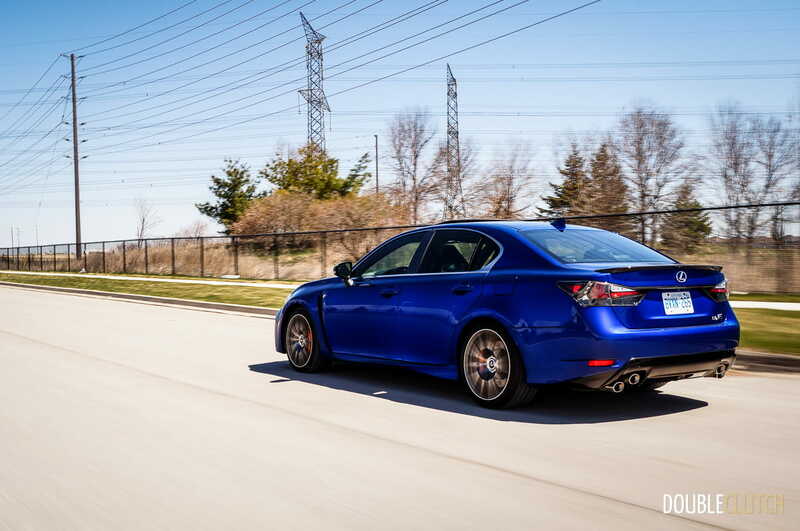 Being a larger sedan than the IS, the GS features generous amounts of space for four occupants, with five in a pinch. 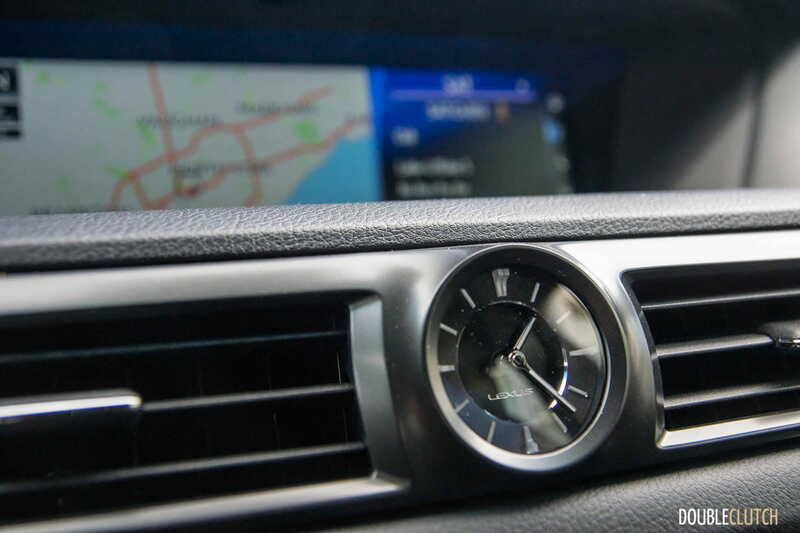 The infotainment screen, as part of the 2016 update, grows to a generous 12.3 inches in size. 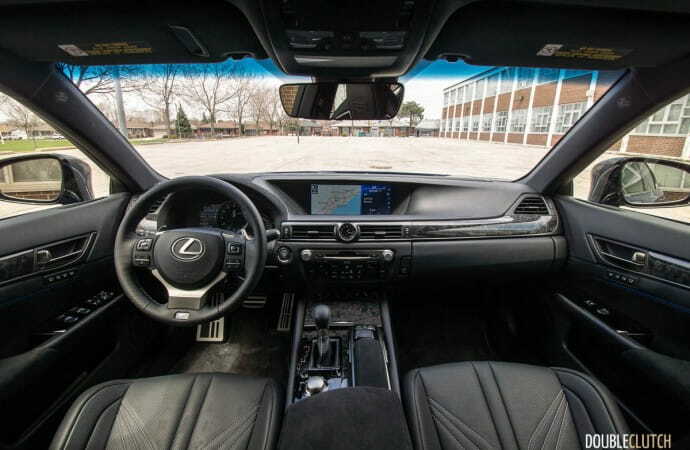 It’s a very wide screen, and Lexus virtually splits the screen in two, somewhat like what BMW does. 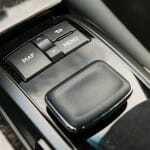 What Lexus doesn’t do, however, is enforce consistency behind their input devices. 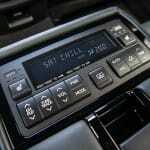 Some cars, like the NX and RC feature Lexus’ newer notebook-style touchpad interface. 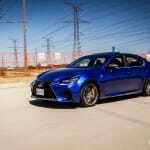 The RX (reviewed here) and IS soldier on with the mouse-style interface, and the GS-F joins this team. 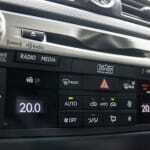 It is an interface that has its fair share of supporters and detractors, and I personally don’t mind it. 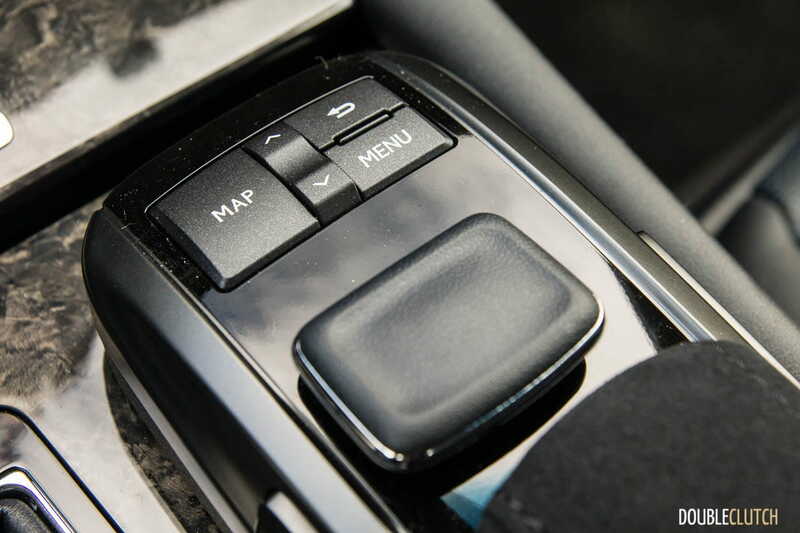 I think some of the hate it gets on the Internet comes from the fact that the driver needs to exercise more coordination in order to operate the mouse, rather than just swiping left and right on the touchpad in other models. 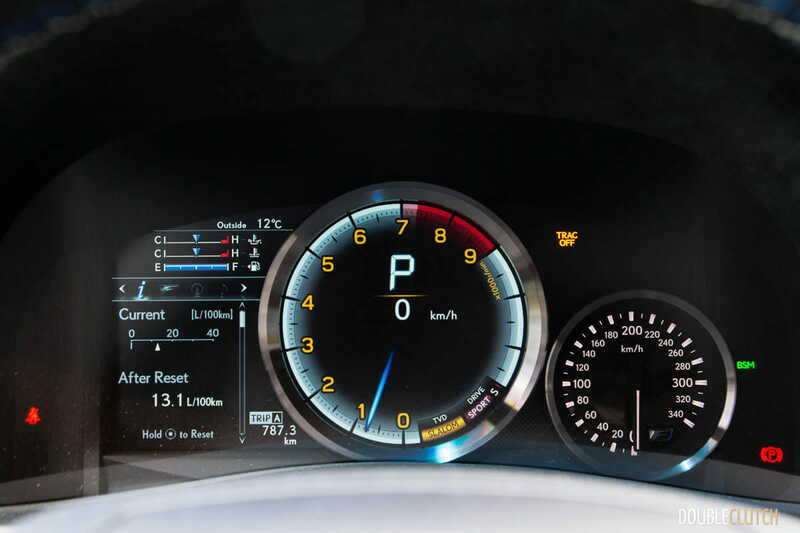 Lexus has done well to spread its digital instrument cluster across the F and F-Sport lineup. 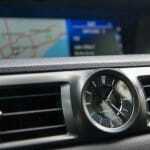 First seen on the legendary LFA supercar, the LCD screen within the metal bezel has made its way into the GS-F. 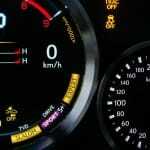 In this implementation, coolant and oil temperature gauges are added. 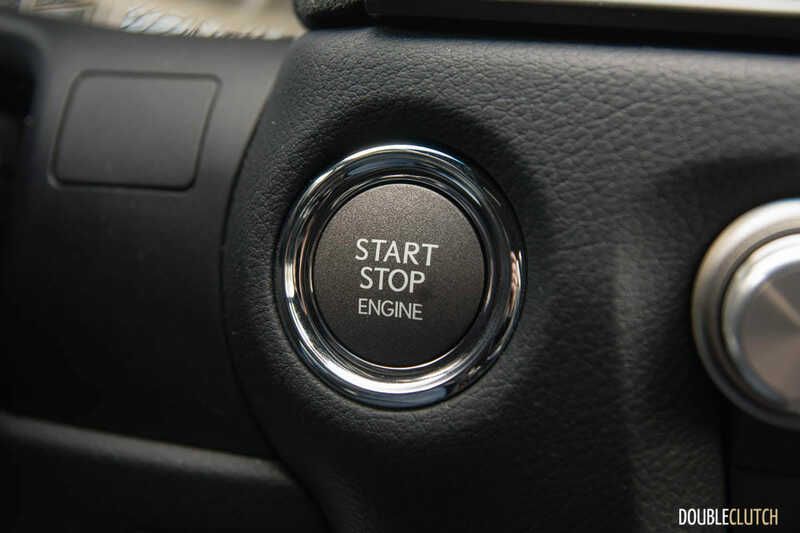 Speaking of temperature, when the coolant and oil temperatures haven’t come up to normal operating ranges yet, the engine reduces its redline – sometimes by half – so everything can warm up gradually. 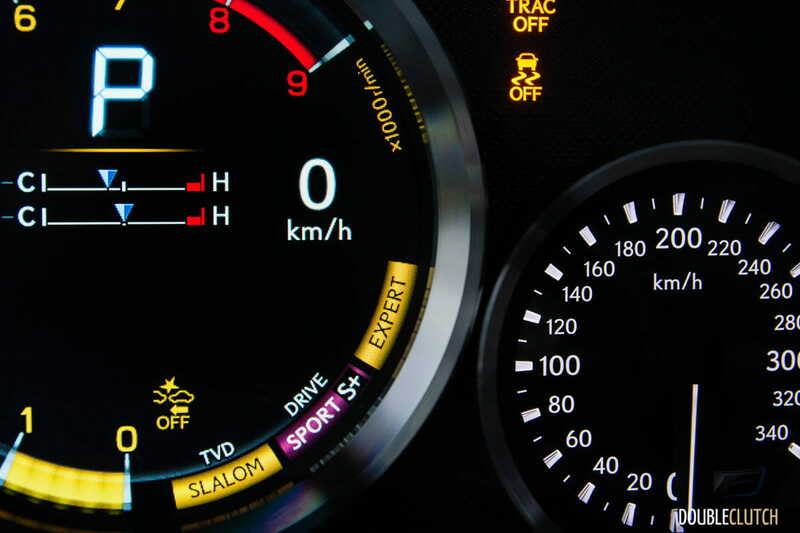 If you disable the traction and stability controls, and play with the various Drive modes, you can even get the tachometer to display “EXPERT”, just in case you needed a reminder of your skills. 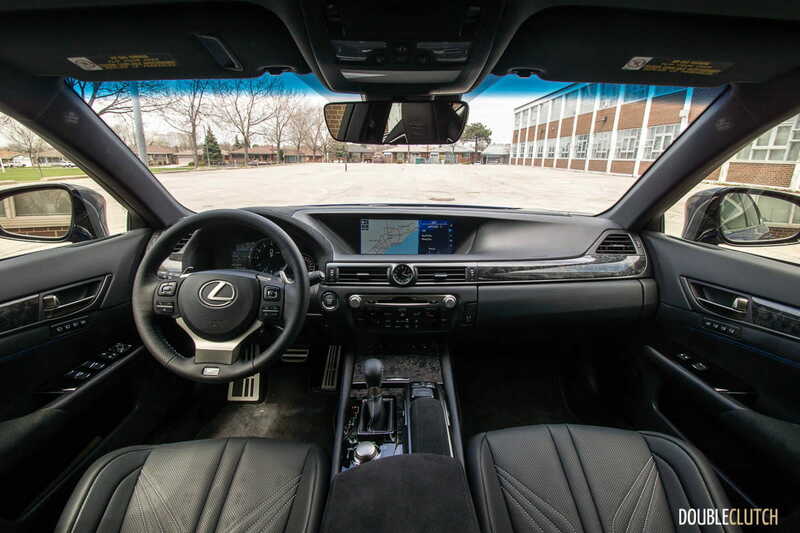 While the driver’s seat is probably the best place to be when you’re in the GS-F, the second-row is treated to a surprisingly excellent centre console with a variety of controls. 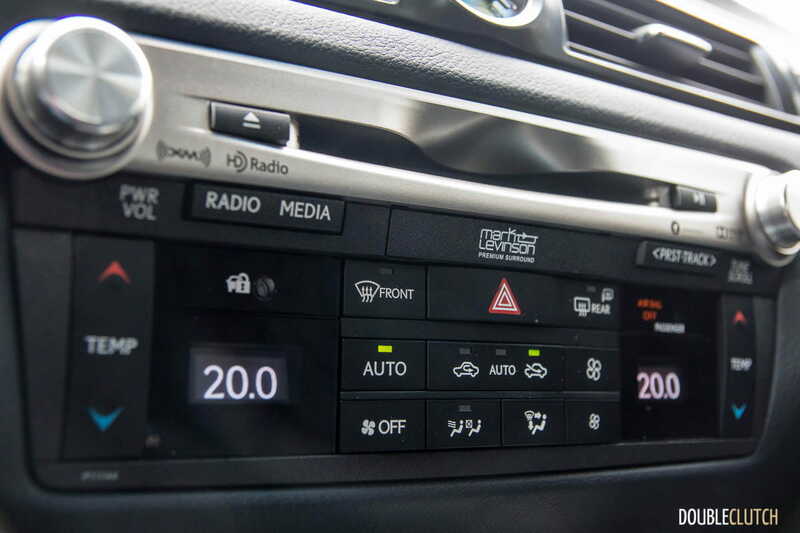 Anybody sitting in the back is able to control their seat temperature, but can also play with an additional climate control zone, as well as control the multimedia interface, and the rear power sunshade. 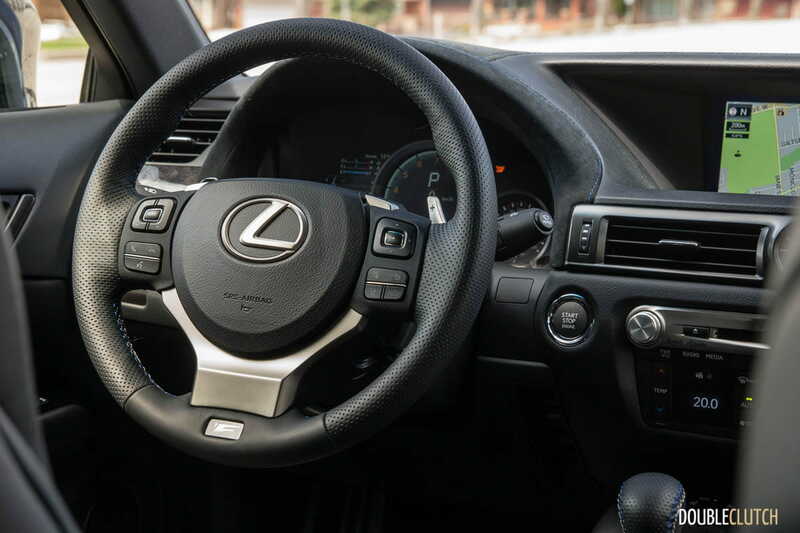 The controls appear to be partially borrowed from the larger Lexus LS luxury sedan, and they really do fit the premium theme Lexus is so good at. 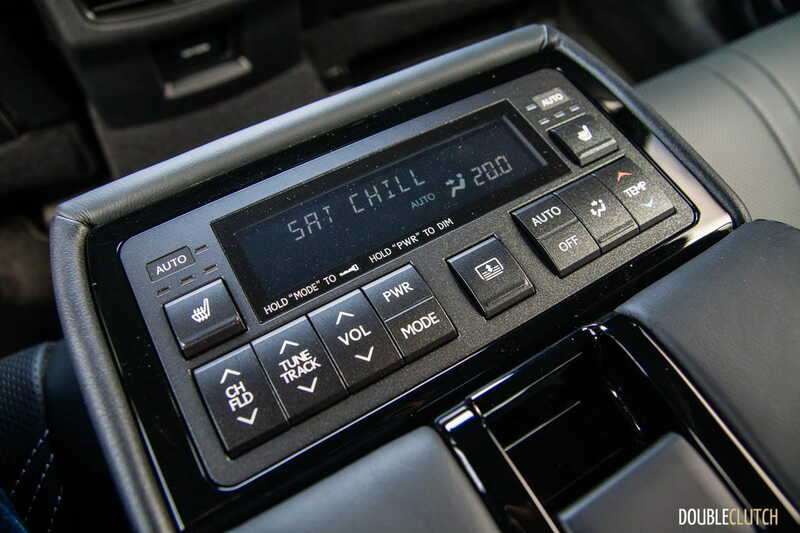 If you’re not listening to the music that is produced by the big V8, you can sit back and crank up the tunes that come out of the standard 17-speaker Mark Levinson audio system. 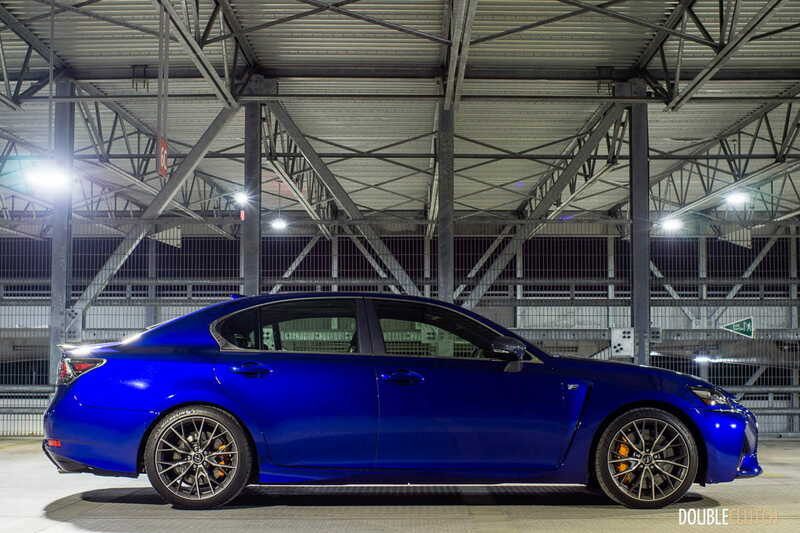 The Lexus GS-F produces its own excellent brand of music, all thanks to that 5.0L V8 under the hood. 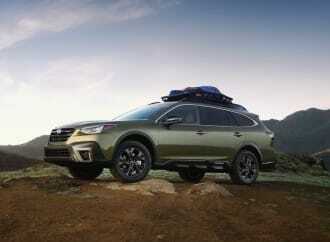 Codenamed the 2UR-GSE, the rear axle gets delivered a robust 467 horsepower at 7100rpm, and 389 lb-ft of torque at 4800rpm. It’s important to note that this isn’t quite the same V8 seen in the second-generation IS-F. 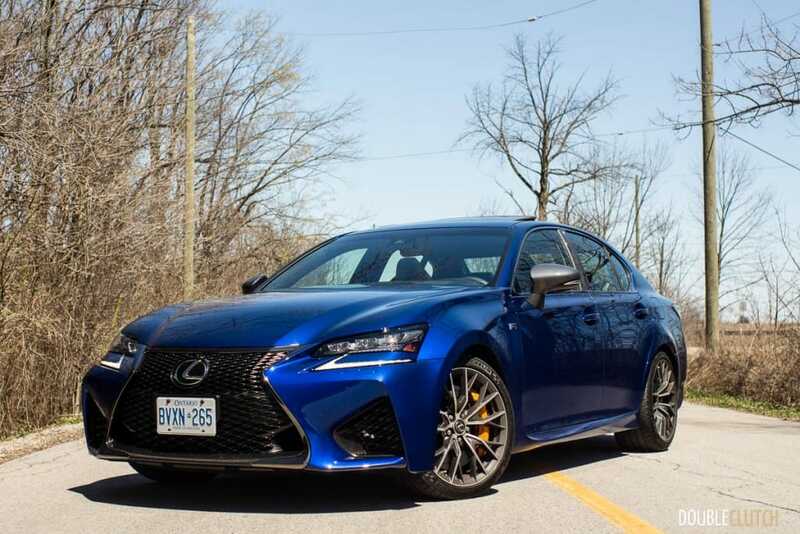 Shared with the powertrain seen in the new RC-F (reviewed here), this direct-injected and port-injected V8 is updated with a higher compression ratio and reduced friction to produce over 50 additional horsepower. 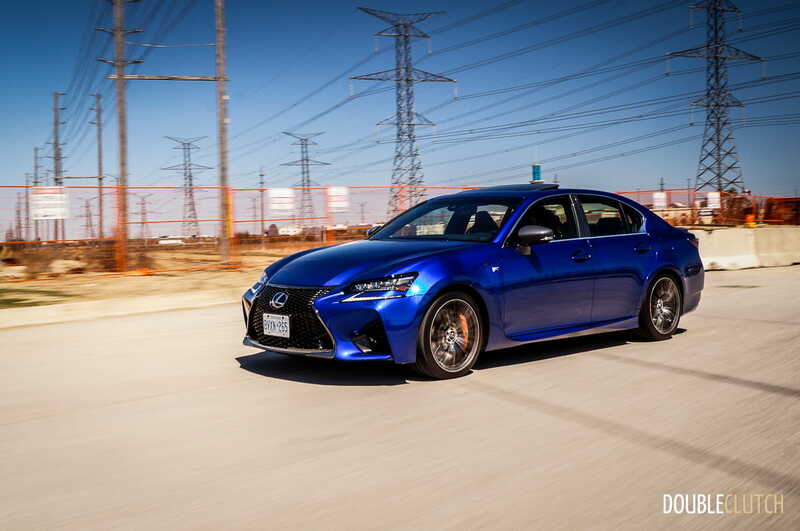 Controlling that power delivery is Lexus’ excellent 8-speed automatic transmission, and a torque-vectoring rear differential (TVD, also available in the RC-F) that doesn’t just use the brakes on the rear axle. 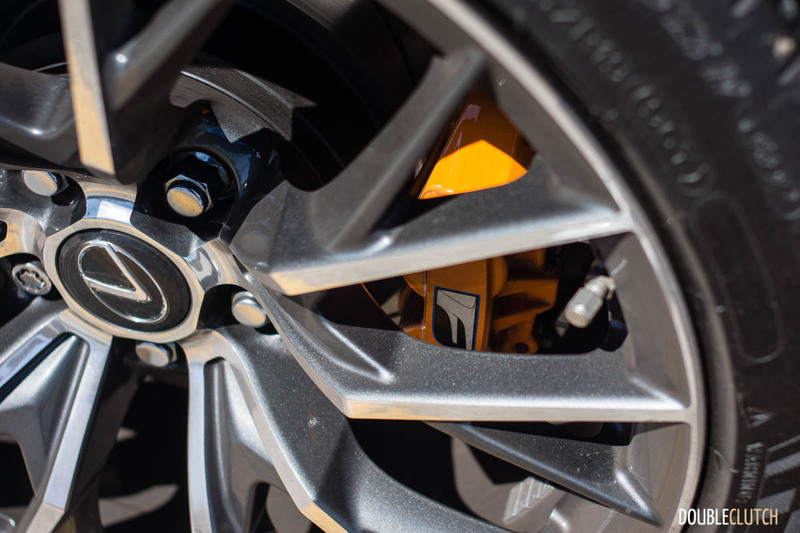 This smart, electronically controlled unit uses clutches to send just the right amount of torque to either wheel. 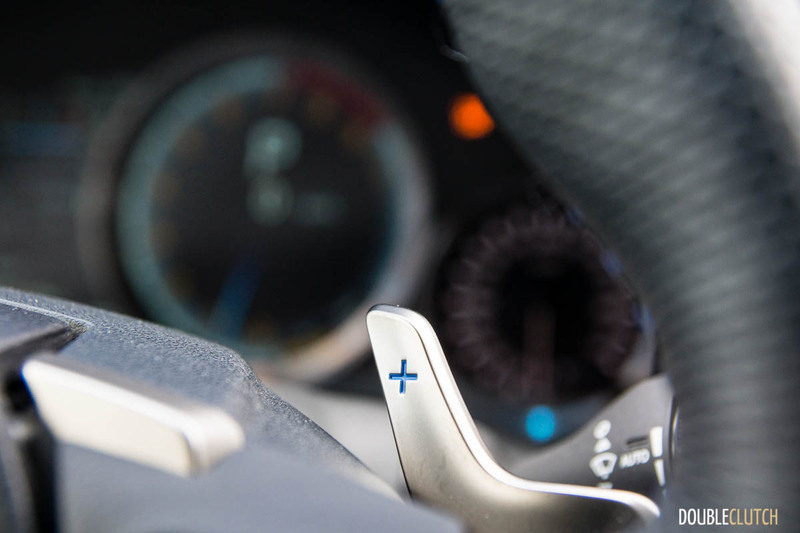 Not only that, but Lexus’ TVD is configurable between two modes: Slalom and Track, both with different levels of clutch engagement, depending on the driving you’re doing. While the powertrain easily dominates the GS-F’s personality, Lexus didn’t forget about all the other hardware that makes it a serious performance car. 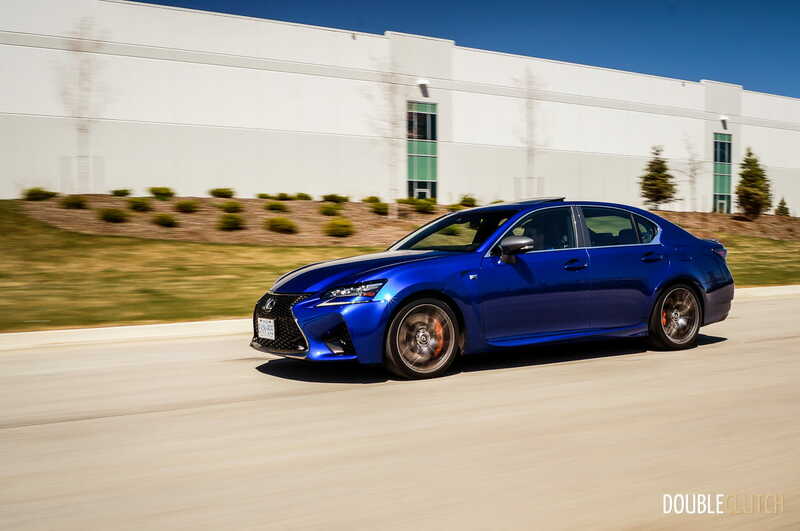 What’s interesting is that the GS-F doesn’t actually feature the adaptive variable suspension that the GS350 F-Sport offers. 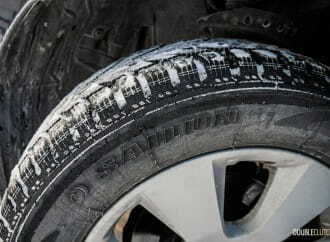 Rather, it uses fixed dampers that are matched up perfectly with the increased spring rates. 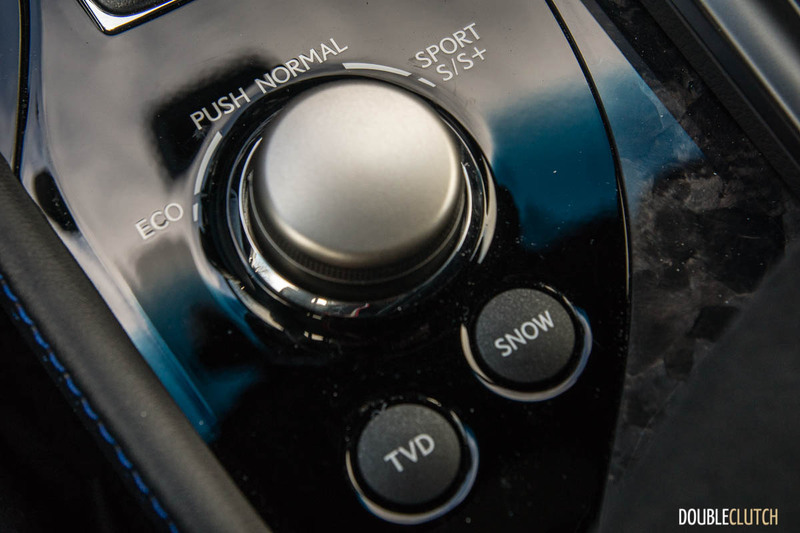 From an engineering standpoint, this is preferable than having a softer spring (for “comfort” use), combined with a firm damper to simulate an increased spring rate when the driver calls for it. 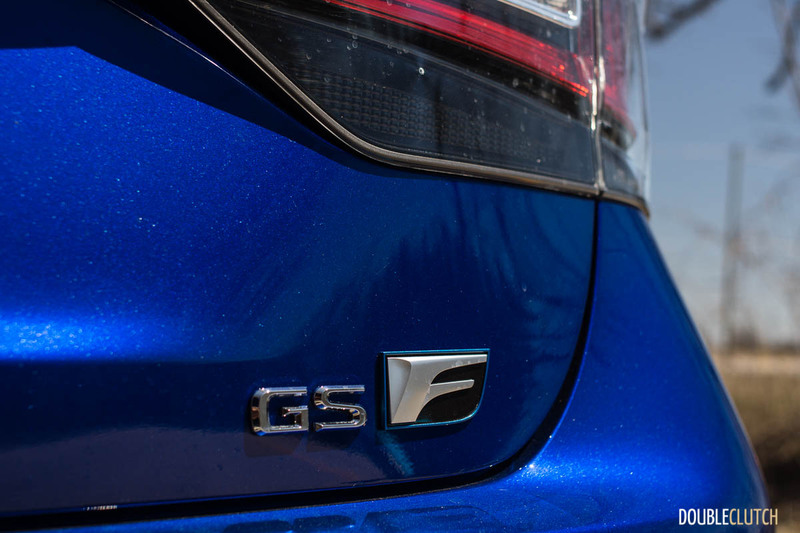 As a result, the GS-F ride is firm, but not punishingly so. 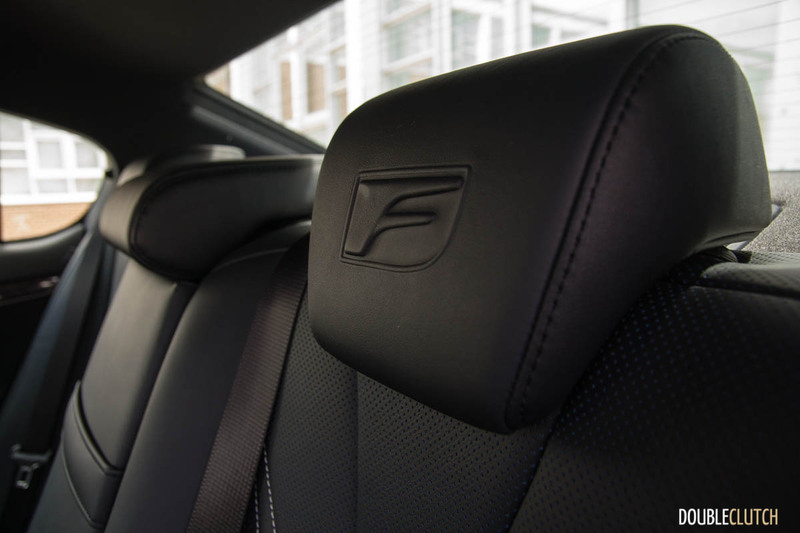 A friend of mine owns an IS-F, and I remember it to be a lot firmer, all the time. 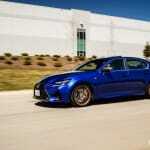 After all, the GS-F still needs to be a luxury car. 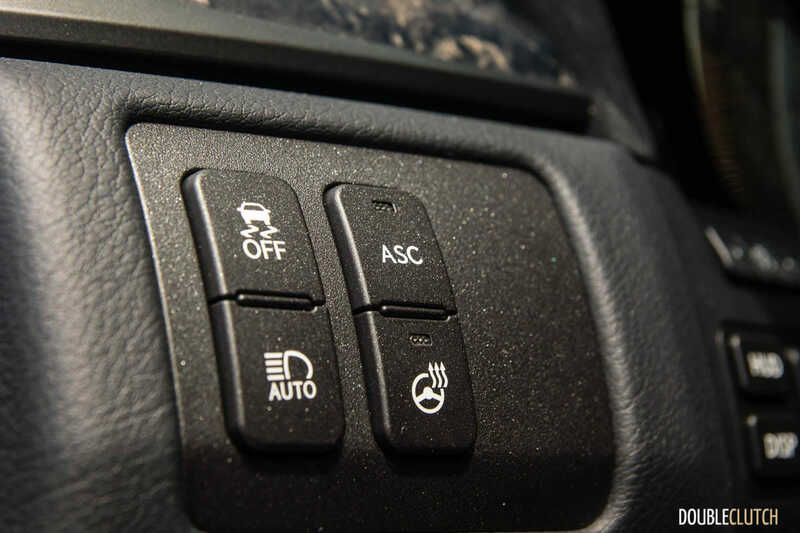 While the Sport and Sport+ driving modes don’t affect the suspension system, they still reconfigure throttle response, transmission behaviour, and power steering settings. 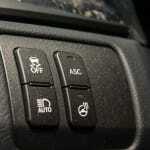 There’s also the now-typical Eco mode that recalibrates all those same settings, but chooses different settings that maximize efficiency. 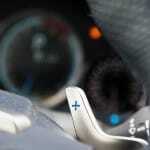 The LCD instrument cluster changes from a tachometer to a blue ring that disappears as you get into the loud pedal. Considering how easy it is to create wonderful baritone music in the GS-F, fuel efficiency still remains high on the list of priorities. 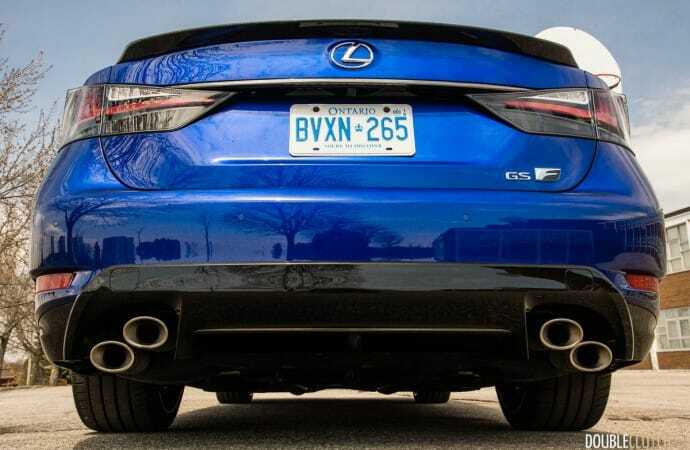 Even with the big V8, Lexus Canada rates the GS-F at 14.9L/100km in the city, 9.7L/100km on the highway, and 12.5L/100km in a combined cycle. 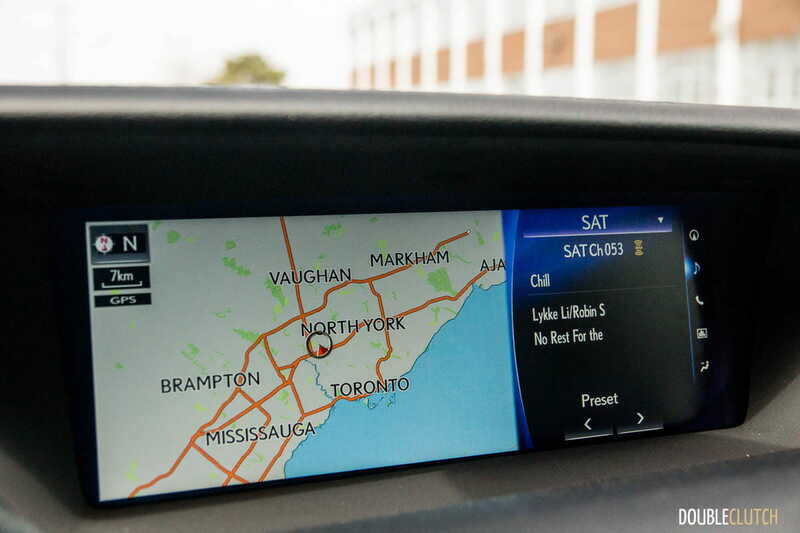 After 800km of very mixed driving, which consisted of several commutes to and from the heart of downtown Toronto, I was very impressed to end up with an indicated 12.8L/100km indicated average. 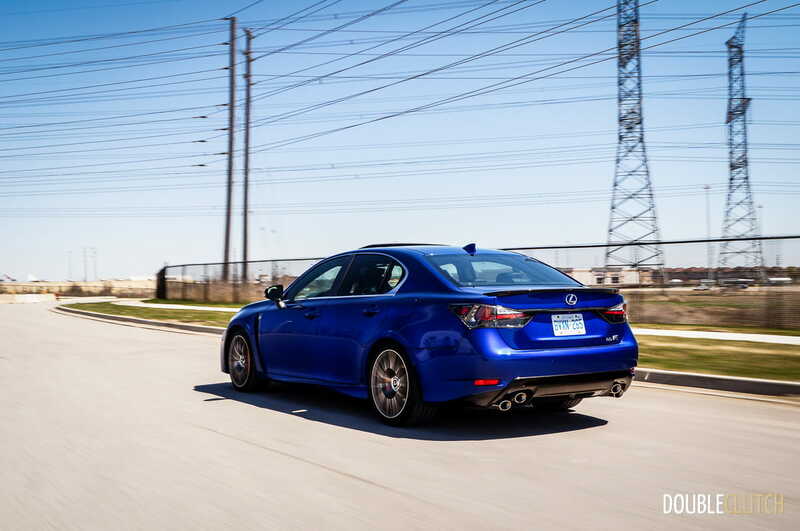 The GS-F doesn’t get technologies like idle start-stop, but the ability to switch to the Atkinson combustion cycle under certain conditions helps improve overall efficiency. 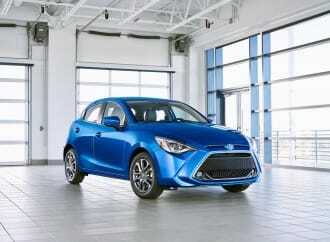 This, combined with the long eighth gear, means impressive fuel efficiency when cruising on the highway. 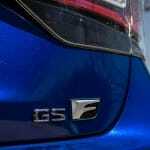 The GS-F will accept 66L of premium 91-octane fuel. 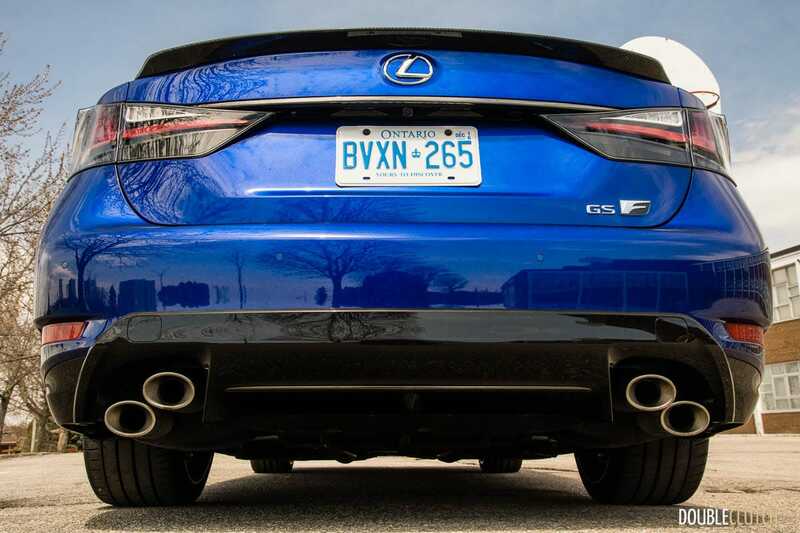 The GS-F sits at the top of the GS lineup, and as such, comes with pretty much everything that might be an option on the GS350. 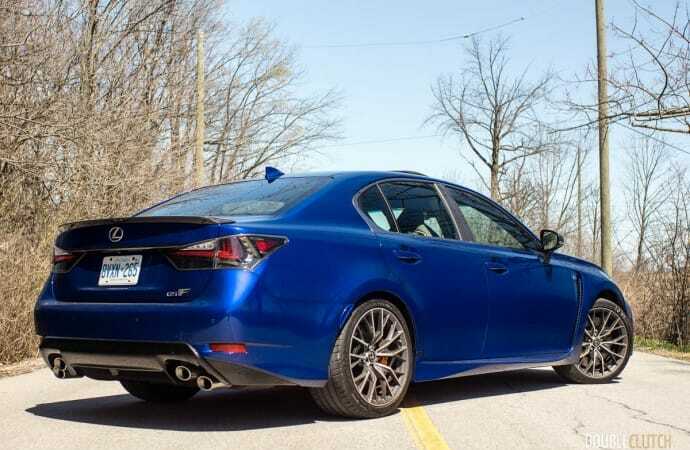 The GS-F starts at a MSRP of $95,000, and there aren’t any option packages available. 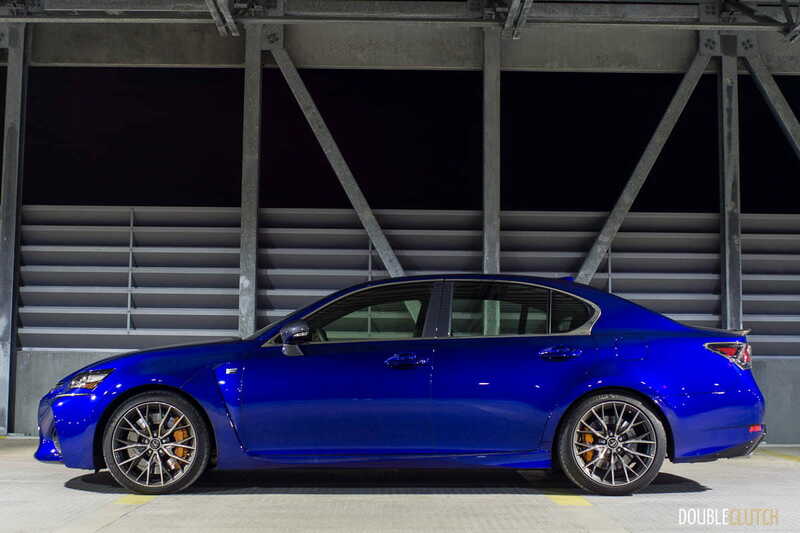 The only thing you need to choose is what colour you’d like your GS-F painted in. 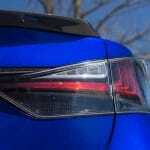 The Ultrasonic Blue Mica 2.0, as tested here, is just about the only option selected, at $650. 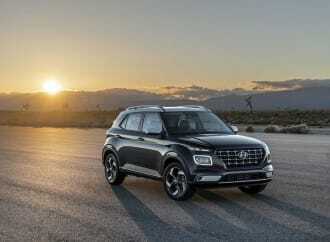 This brings the as-tested subtotal to $95,650, and that’s before taxes and additional dealer fees. 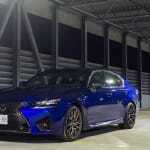 This brings us to the question of where the Lexus GS-F fits in the market. 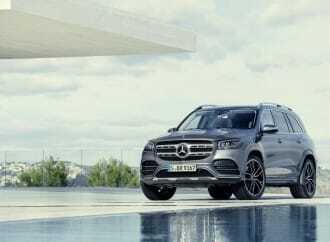 Like I said earlier, I don’t think it’s most accurate to compare it to the super-heavyweights like the BMW M5 and Mercedes-Benz E63 AMG. 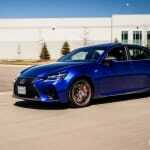 The big differentiator between the GS-F and the two players from Germany is the spec sheet. 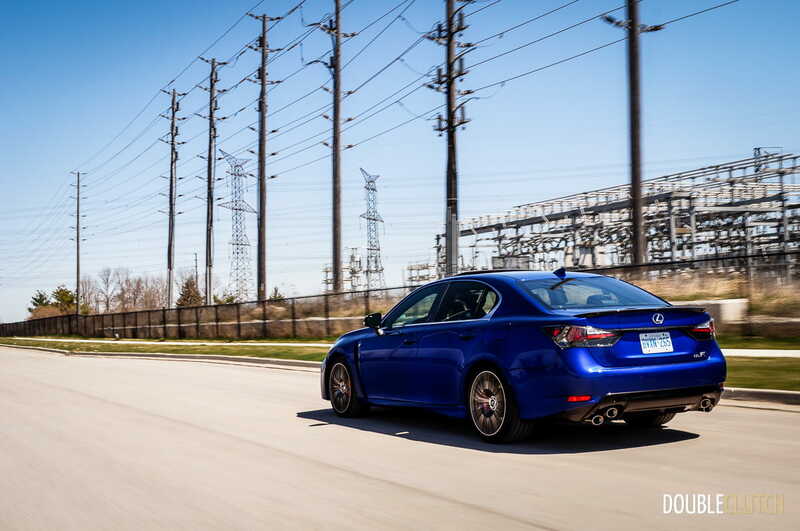 The GS-F is down on power by a significant margin – almost 100hp. Secondly, the GS-F is priced differently, going for at least $10,000 less, even before you add optional equipment. 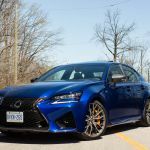 With this understanding, it makes much more sense to compare the GS-F to the BMW 550i, Mercedes-Benz E550, and Audi S6 (reviewed here). 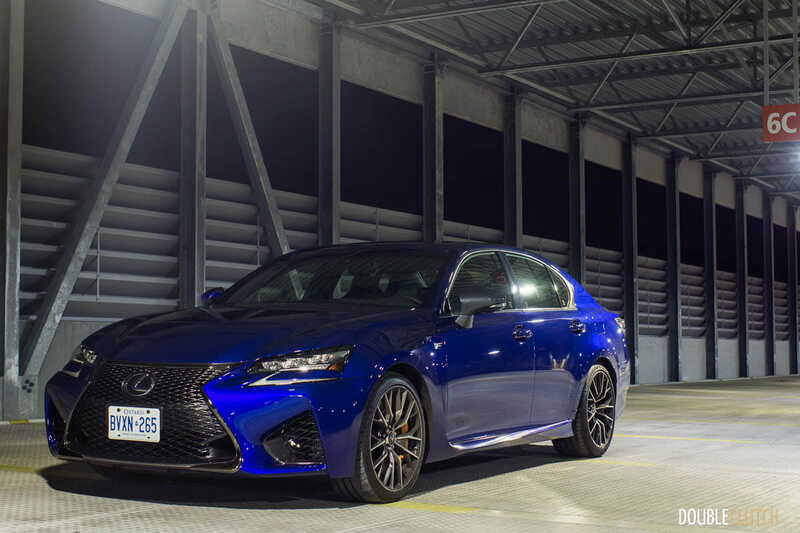 The GS-F compares much more favourably, with more power, more features, a more engaging drive than any of the aforementioned competitors, and in most cases, a lower purchase price. Simply comparing powerplants, all three of the German options come with turbocharged V8 engines; while they are great for delivering low-end torque, they simply do not exude the character the GS-F does. The 5.0L four-cam V8 even sounds like a Chevrolet small-block V8 at times. 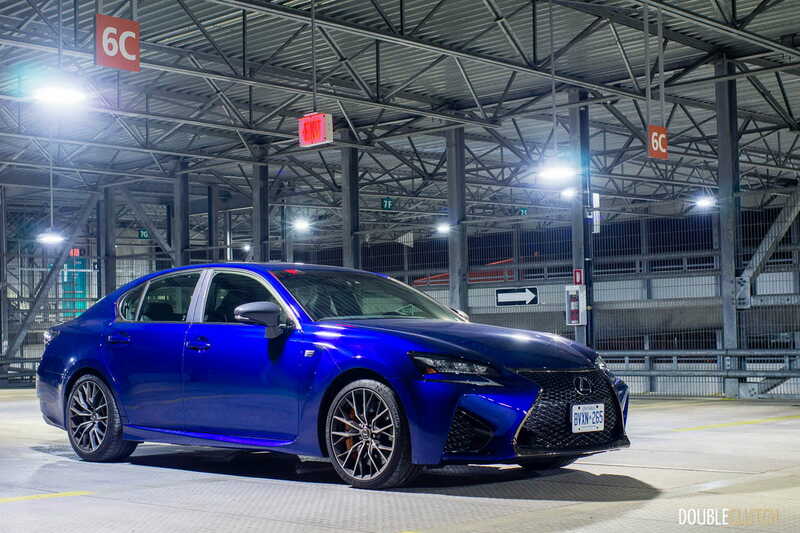 The one common denominator here is that all-wheel drive is standard equipment on all three of the German choices, whereas the GS-F doesn’t make it available at all. 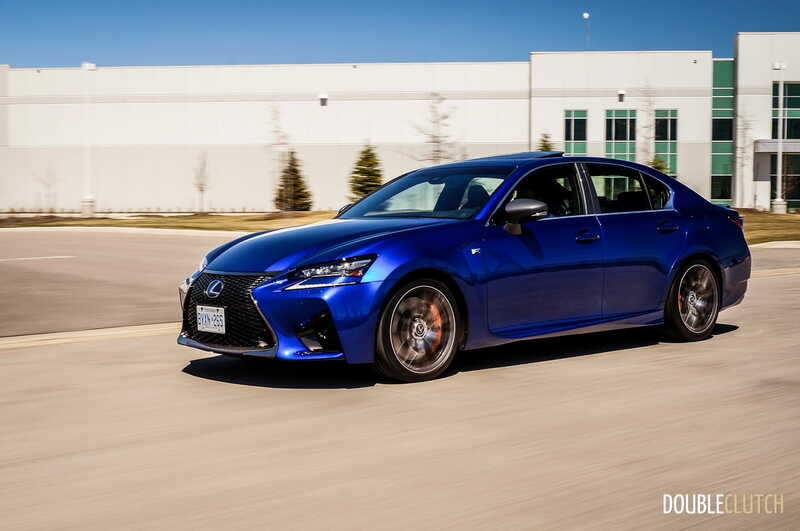 Considering how many luxury vehicles are sold here in Canada with all-wheel drive, you may consider this a drawback with the Lexus, depending on your priorities. 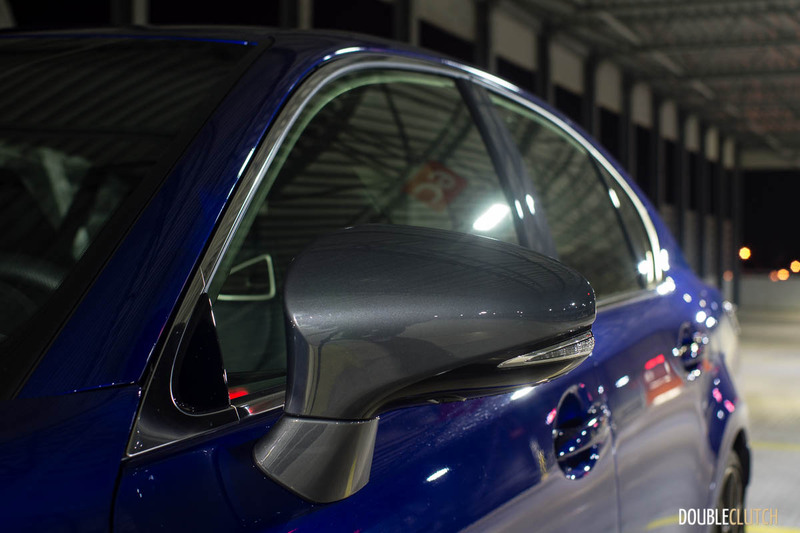 When it comes to choosing a mid-sized four-door luxury sedan, the choice you have these days is impressive. 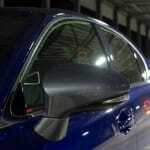 The Europeans have been the traditional choice, with their well-refined executive saloons. 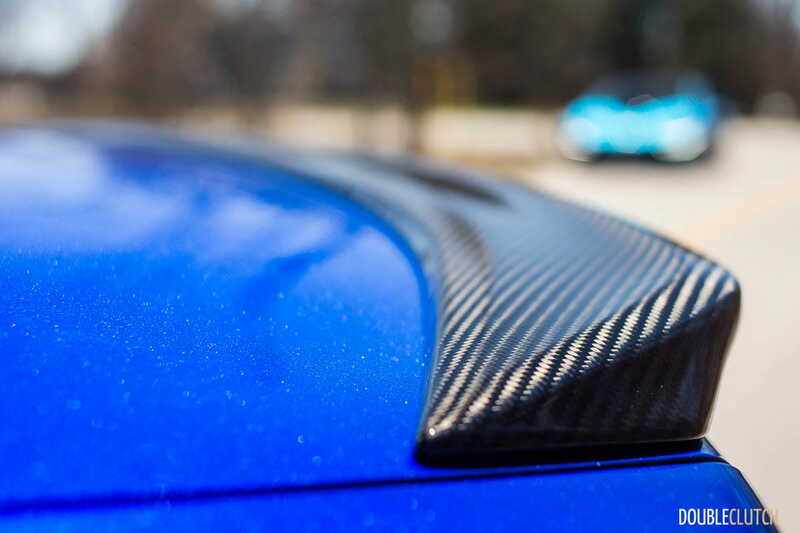 What if you’re looking for something a little different than the usual staid German sedan? What if you’re looking for something other than the usual fifty shades of silver, white, or black? 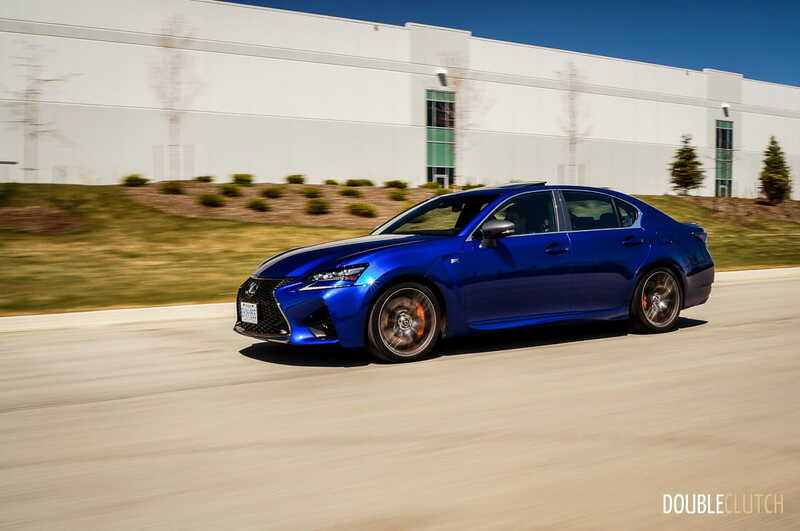 The Lexus GS-F gives you that luxury, uniqueness, street presence, rock-solid reliability, and performance capabilities, all in one package. It flies under the radar in a slightly different way, with only subtle hints of what lies beneath. 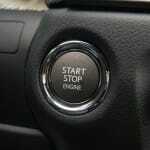 Once you push that engine start button and hear the raucous naturally-aspirated V8 bark from the exhaust, you know you’re in for a treat, every single time. 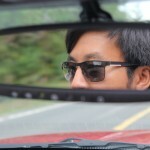 It’s also the kind of car you turn to look back at, as you walk away. 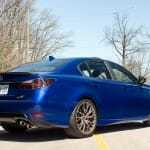 The Lexus GS-F is hands-down my choice in this class of “almost” super-sedans.